Demonstrators massed outside Capitol Hill after marching down Pennsylvania Avenue waving placards and chanting 'Enough, enough'. EDIT: Reports that emergency services estimated the protest at just a few thousand, not two million, just to clarify.. The focus of much of the anger was the president's so-called 'Obamacare' plan to overhaul the U.S. health system. 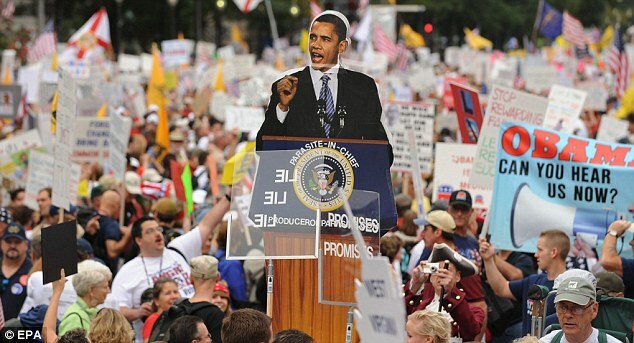 The protest on Saturday came as Mr Obama took his campaign for health reforms on the road, making his argument to a rally of 15,000 supporters in Minneapolis. Saying he was determined to push through a bill making health insurance more affordable, Mr Obama said: 'I intend to be president for a while and once this bill passes, I own it. Terri Hall, 45, of Florida, said she felt compelled to become political for the first time this year because she was upset by government spending. 'Our government has lost sight of the powers they were granted,' she said. She added that the deficit spending was out of control, and said she thought it was putting the country at risk. Republican lawmakers also supported the rally. 'Republicans, Democrats and independents are stepping up and demanding we put our fiscal house in order,' Rep. Mike Pence, chairman of the House Republican Conference, said. 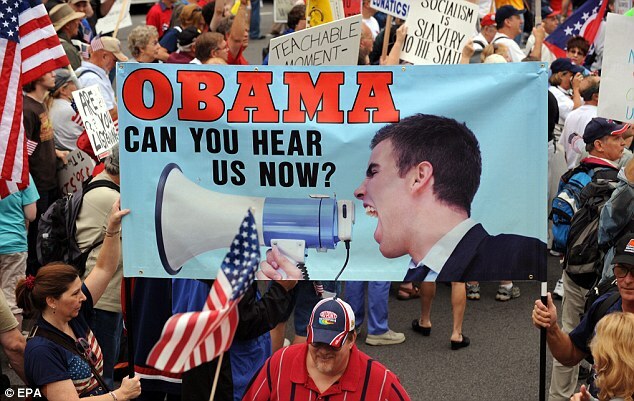 Organisers said they had built on momentum from the April 'tea party' demonstrations held nationwide to protest at Mr Obama's taxation policies, along with growing resentment over his economic stimulus packages and bank bailouts. Recent polls illustrate how difficult recent weeks have been for a president who, besides tackling health care, has been battling to end a devastatingly deep recession. Fifty per cent approve and 49 per cent disapprove of the overall job he is doing as president, compared to July, when those approving his performance clearly outnumbered those who were unhappy with it, 55 per cent to 42 per cent. Just 42 percent approve of the president's work on the high-profile health issue. The poll was taken over five days just before Obama's speech to Congress. That speech reflected Obama's determination to push ahead despite growing obstacles. Prior to Obama's speech before Congress U.S. Capitol Police arrested a man they say tried to get into a secure area near the Capitol with a gun in his car as President Barack Obama was speaking. On Thursday police spokeswoman Kimberly Schneider said that 28-year-old Joshua Bowman of suburban Falls Church, Virginia, was arrested around 8pm on Wednesday when Obama was due to speak. Bowman's intentions were unclear, police said. I know some people here may see these people as guardians of the free market, but for goodness sake the President was simply trying to introduce some sort of public option for health insurance. Accusations of 'socialist' and 'fascist' and even 'communist' are way out of line. If some of these people really are convinced that the President is trying to nationalise all American industry and is a statist then that is an epic failure on behalf of the American media, particularly Fox News. How can I improve this An Inspector Calls essay? 2 out of some 300 million is a NOTHING. They fail to realise the essence of their healthcare and education systems are inherently socialist. Republican fail. If they hate socialism so much they should send their kids to privates schools then stop using public schools, and whilst they're at it they should stop using other state services like the fire service and police. If they're going to hate state provided services, they might as well do it properly. Whilst they're at it they should stop buying from 'socialist' car companies and banks that accept government payouts, and they should stop driving on roads maintained by socialist state taxes. Hypocrites the lot of them. 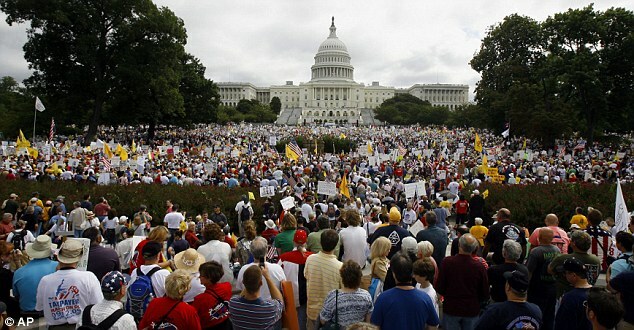 If this was the Glenn Beck thing organised for the 12th September, crowd estimates were at 30,000. That's 300 million people nicely summed up. 5PASTIC. Socialised medicine is socialist. I don't see how calling a spade a spade is so out of line. These people are, however, by and large retards for entirely different reasons. Accusations of 'socialist'... are way out of line. I'm surprised people say stuff like this in Britain, where "socialist" is hardly some sort of political swear word. Obama's policies are pretty openly moderate socialistic. That it isn't said openly is mostly a result of America's bizarre political terminology, where social democrats are called "liberals" and "socialist" means some sort of USSR spy. This is by no means a correct use of language, though. 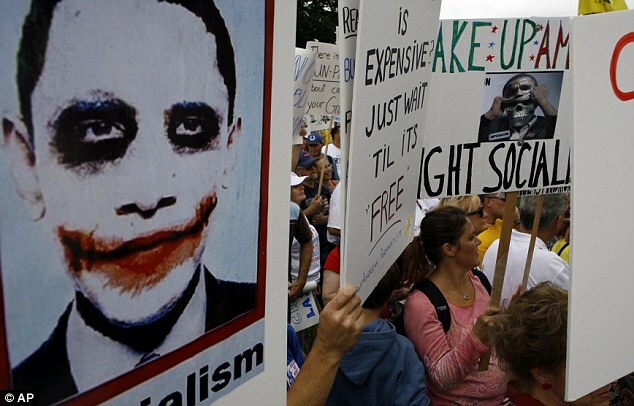 If they think socialism is so bad maybe Obama should forget the whole free healthcare thing. I mean seeing as the people are so against socialised public services. Oh, and while he's at it he should get rid of all the other evil socialised public services, like public libraries. And public transport. Don't forget evvvilll public schools! The US postal service too! 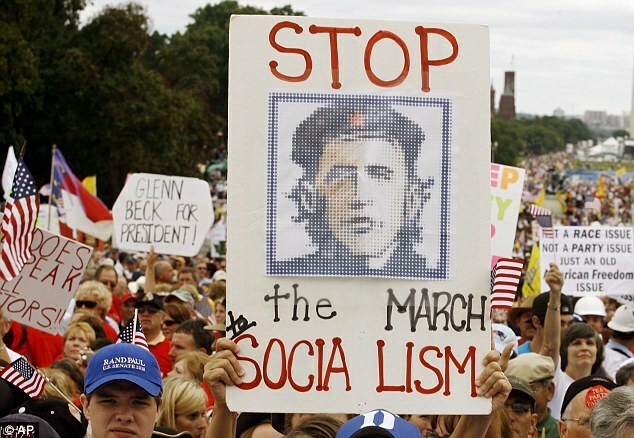 Keep in mind, many of these people are opposed to Federal socialism on Constitutional grounds. Most of the things you listed are maintained by state governments. Obama's plan does not propose state ownership of the healthcare industry. In the UK yes, the hospitals are owned by the government, the medical staff are hired by the government; it is a socialised system. The Obama proposal is similar to the Dutch model where there is just a public health insurance option. The healthcare industry itself remains entirely in the market sector. That is all that is being proposed. You seem fairly pro-state for someone with an "anarchist" flag in his profile. If you really are an anarchist, do you use state services yourself? If so, they presumably do so for the same reason you do - the state has engineered a situation where it is very difficult or impossible to live otherwise. Sorry, I meant that the communist and fascist allegations are out of line. The socialist label is just incorrect. What's so great about the USPS, an inefficient monopoly that overcharges its customers and enforces this by having the police raid companies that offer cheaper postage? Or the appauling US state education system? Shut it all down and you'll have no complaints from me, or indeed many Americans. Why should the poor get health care anyway. They are poor for a reason, they didn't work in school so they don't deserve the health care folk like me pay for in this country. Ah glory be to the BBC! If we didn't have them holding news reporting to some level of sanity in this country then we too may have the likes of Fox News trying to brainwash the electorate. I would like to think that the British wouldn't fall for it as quickly as the stars and stripes, but in reality I don't hold out much hope. There have been many times where I wa tempted to post a dictionary to Fox news HQ with a pointer to the definitions of socialism and facism, but they would quite rightly realise that its far more profitable to ignore such inconvienient truths. Well, I don't think it is. He wants state subsidised health provision - right or wrong this is certainly a socialist policy. Communism and fascism are just other forms of socialism. Probably an exaggeration, but then these things are never clearly defined anyway. 'Bout time someone (or 2 million someones) said something about the complete nonsense Obama is trying to pull. We understand healthcare reform is important to him. We understand the House has a Democrat majority. But his plans are absurd. Thankfully there are still some Republicans thinking and breathing! EDIT: I was negged for this post and for utilising the right to free speech because apparently I lack sense. Will Trump go down as the worst president in history? Russian state TV: "Trump belongs to us"